THEY DO SAY that cats have nine lives, so we wonder how many these little kittens are down to. One things for sure, they survived being accidentally shipped almost 200 kilometres with at least one to spare. Two newborn kittens were boxed up with fibreglass equipment and shipped to San Diego from Los Angeles according to ABC News. An employee of Cox Communications was shocked to discover a purring in the company’s warehouse, where he discovered the two-week old kittens amongst the equipment. We have the only 24-hour kitten nursery. Most shelters don’t have staff operating around the clock. It was pretty lucky they ended up in San Diego. The staff suspect that the mother left them in a safe place, but left, leaving them there to be boxed up. The two kittens, now named Mouse and Wifi, are receiving around the clock care, and the center says they will be healthy and ready for adoption when they reach eight weeks. 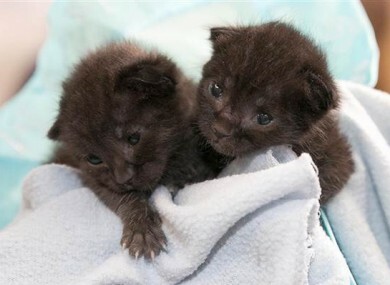 Email “Two newborn kittens survive being boxed up and shipped 120 miles”. Feedback on “Two newborn kittens survive being boxed up and shipped 120 miles”.